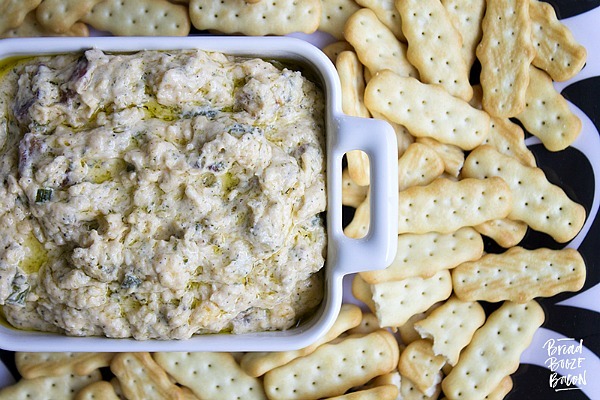 Making Easy Football Party Appetizers is your best defense on game day. These easy game day recipes are the ultimate way to score on Super Bowl Sunday ! One of my favorite things about the Super Bowl is game day food….ok and the commercials! 😉 This year I’m hosting the party for the big game so I’m making easy football party appetizers that are no fuss, delicious and hearty to feed my hungry friends and family. The key word being easy! I don’t want to spend all day in the kitchen I want to be able to enjoy the game too. 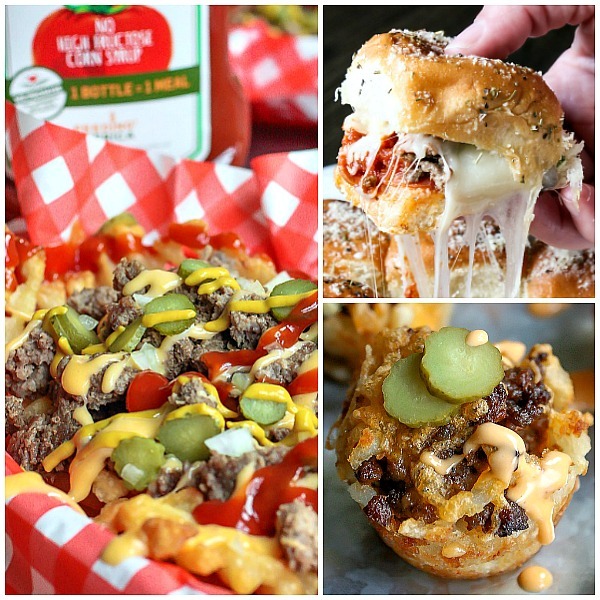 I’ve got some of the basic easy football party must haves on my menu including easy sliders, wings and cheesy dips. I also have a new obsession with tater tots, wait until you see what I have come up! 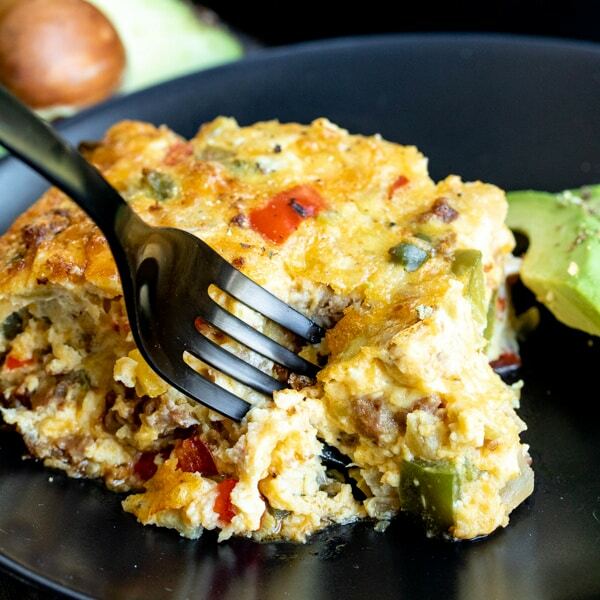 All of these recipes can be eaten with your hands on paper plates with no utensils. You know I’m all about saving time when it comes to cleaning up! Since my beloved team lost in their first playoff game (bitter party of one), I’m putting all of my energy into planning super easy football party appetizers loaded with cheese and carbs. I’ll even throw in a few low carb appetizers to keep everyone happy :). Did I mention, cheesy goodness? 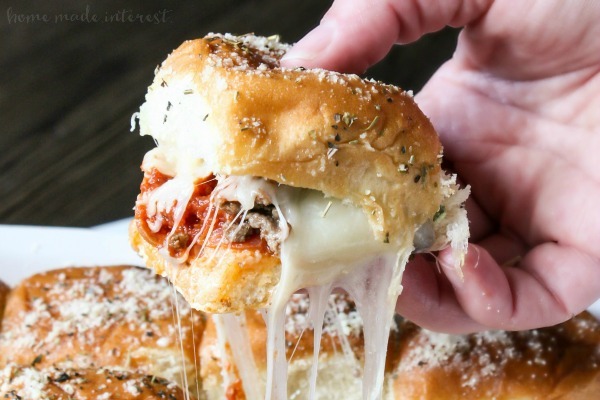 This easy pizza sliders are amazeballs! We’ve got all new recipes to make your game day party awesome including sweet slider recipes like s’mores sliders. You’re guests are guaranteed to clean their plates if you make a few of these easy slider recipes. 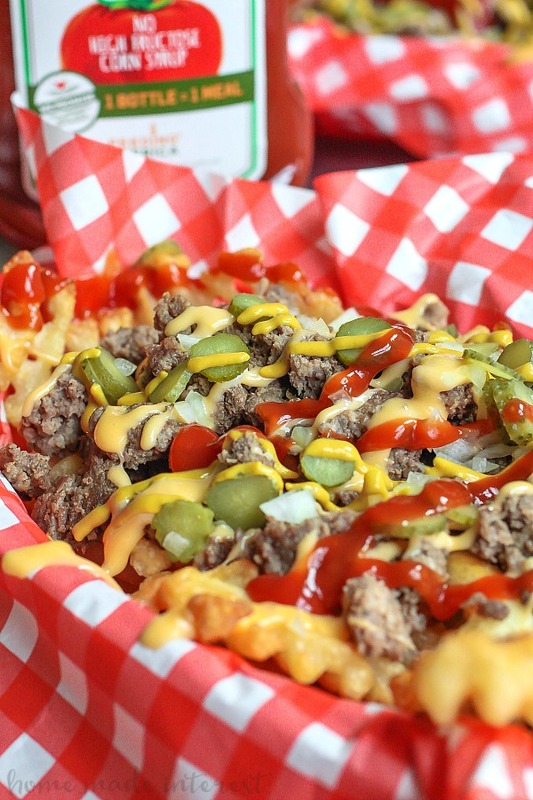 These Loaded Cheeseburger Fries went so fast, when I turned my back to try some they were all gone. Clearly my friends are savages! Serve them in these cute red plastic baskets with matching wax red and white paper. 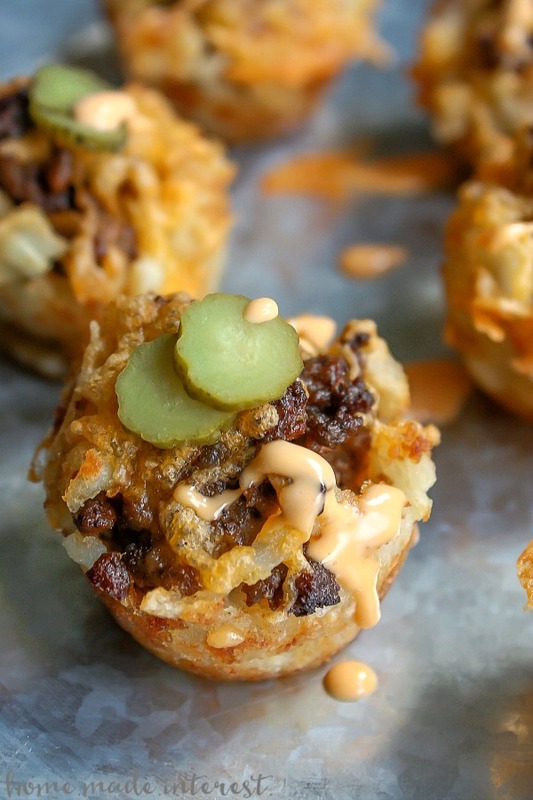 My little darling Cheeseburger Tater Tot Cups, how I love you so. I used a mini muffin tin and one of my favorite kitchen tools, the tamper to make these perfectly shaped tot cup. You can fill them with anything your heart desires. Great for breakfast on the go too. Did I mention my tot obsession? 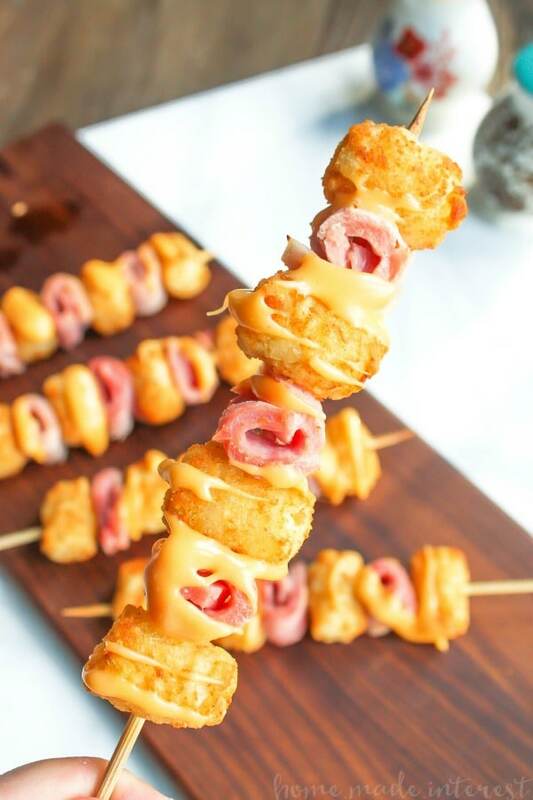 These cheesy Ham and Cheese Tater Tot Skewers are my kids’ favorite. 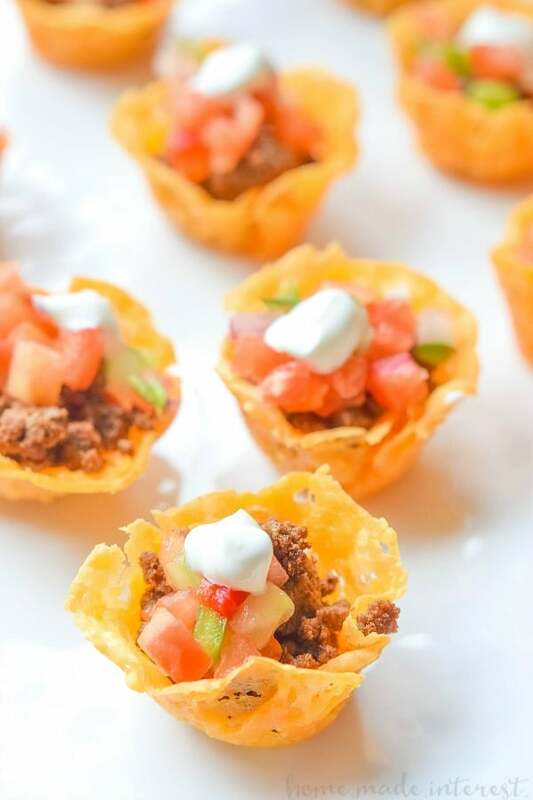 These low carb taco cups are delicious and a great option for all the carb haters low carb enthusiast. 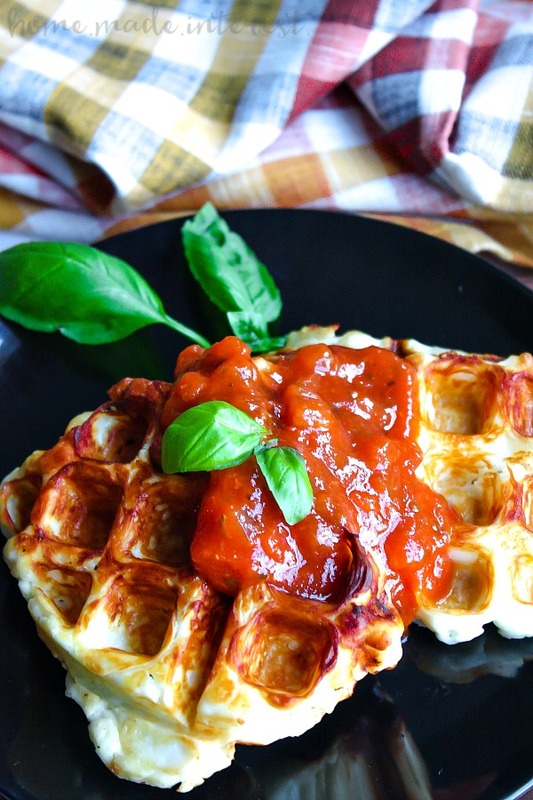 Speaking of low carb recipes…get that waffler maker out for these low carb Cheese Waffles! Since it is made purely of cheese it can only be delicious. 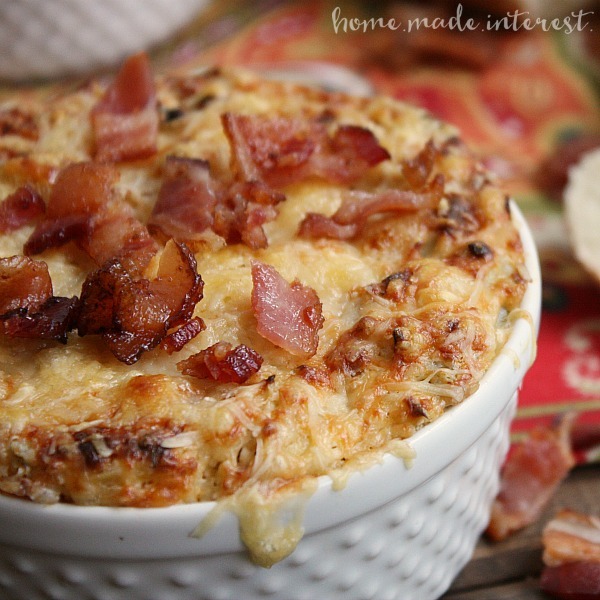 This easy Bacon Artichoke Dip recipe is a mix of artichokes, rich and creamy cheese, and the smokey flavor of bacon. Without question one of my favorite dips. 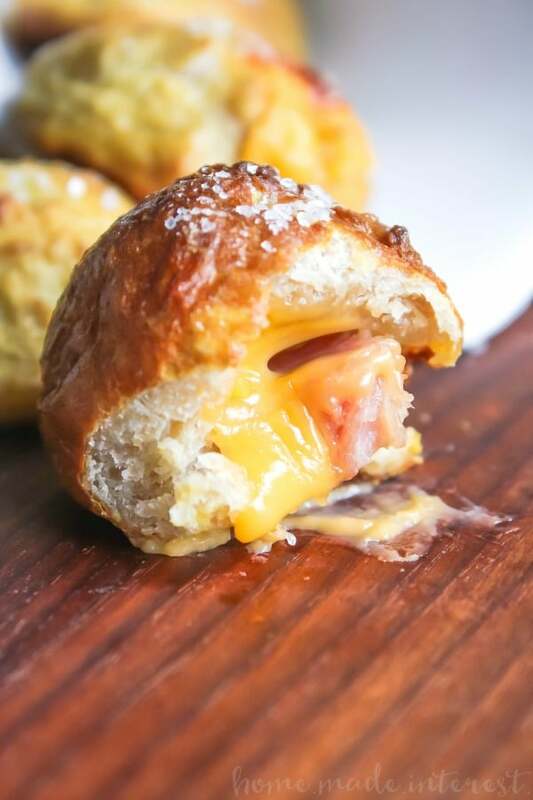 These Ham and Cheese Pretzel Bombs are literally the bomb.com. Another kid favorite too. Using the the same dough from the the bomb.com Ham and Cheese Bombs, I’m making Pretzel Bites. 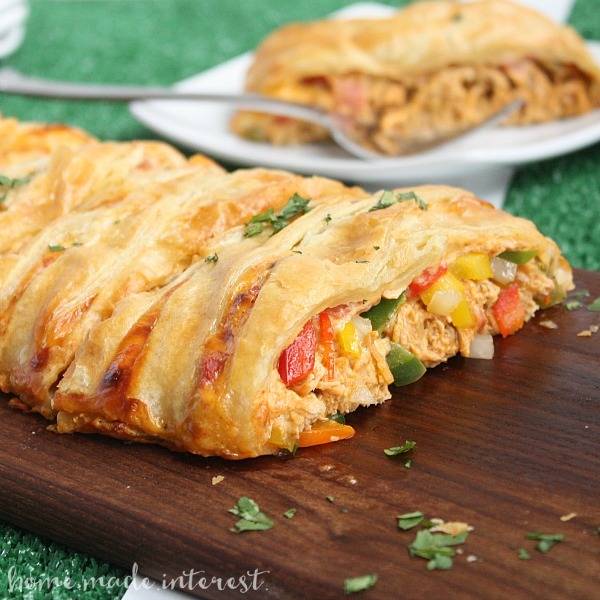 Everyone loved this Chicken Taco Braid last Super Bowl so I’m making it again. No need to reinvent the wheel. If it works, I will keep making it. Did you think I was only making only one easy sliders recipe? Not possible with my crowd. They love sliders! 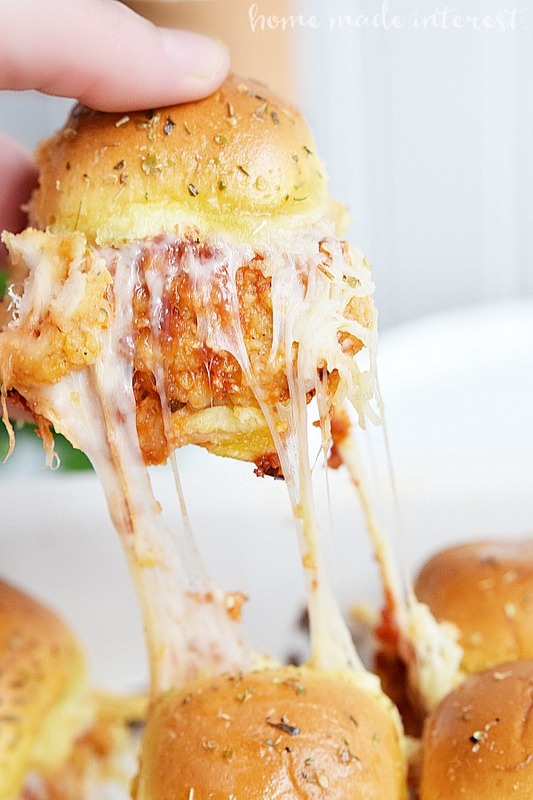 These Chicken Parm Sliders are so simple they just require you to layer a few ingredients and popping in the oven. Do you see a recurring trend with my easy football party appetizers? CHEESE! 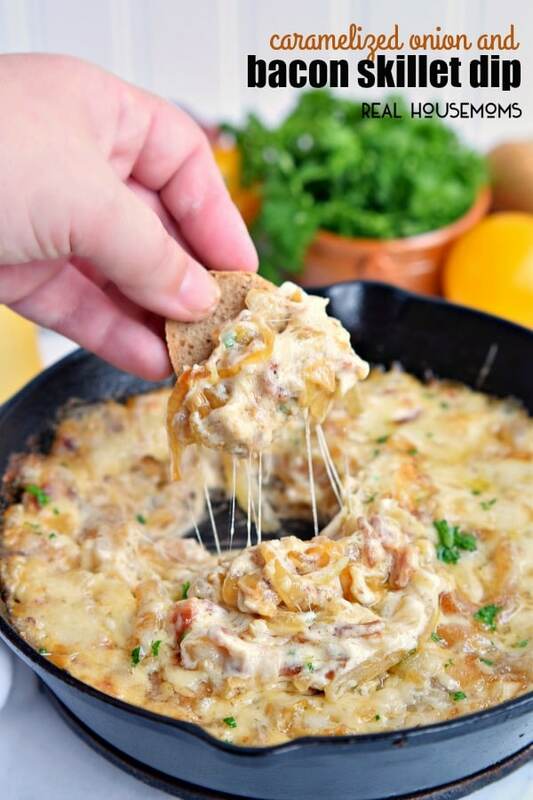 Being a big fan of French onion soup, I was inspired and made an ooey gooey Caramelized Onion Bacon Skillet Dip. It also has beer in it 🙂 Yum! I love that this is made in the slow cooker. Just throw everything in and forget about it until it’s game time! This Slow Cooker Bacon Ranch Dip only takes 1 1/2 hours to make. 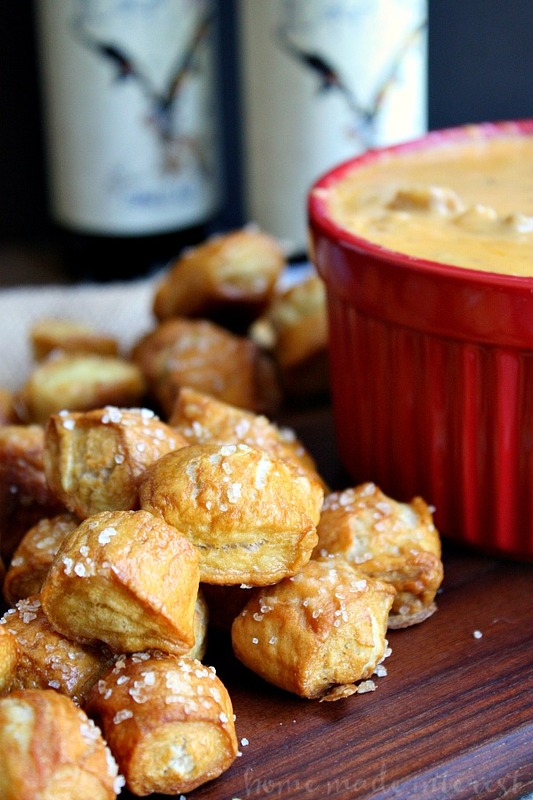 Are you in a food coma from looking at all these insanely delicious appetizers? You gotta have wings while watching the game. 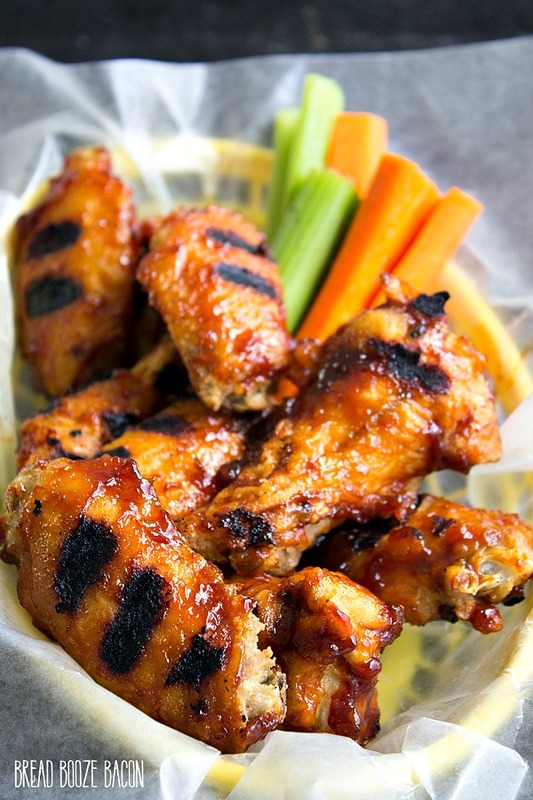 These Grilled Cajun Chicken Wings are easy to make and loaded with flavor. 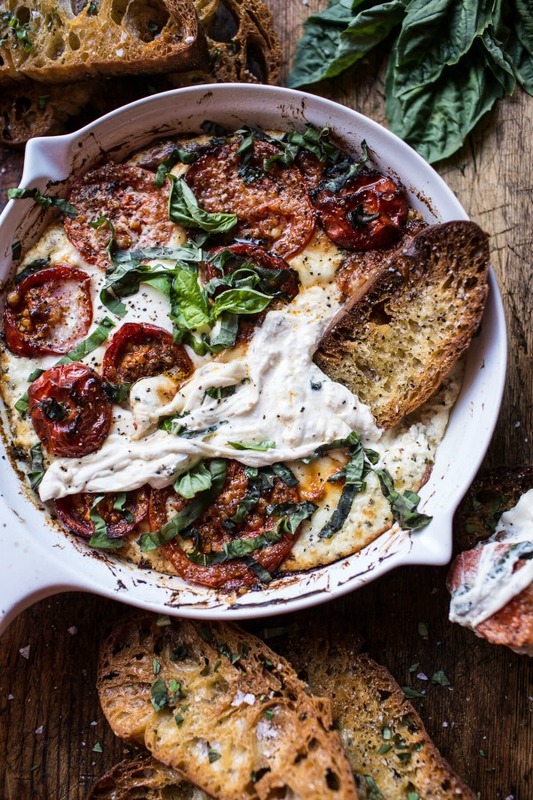 Not sure I can wait until game day to make this Margherita Pizza Dip. My mouth is watering! 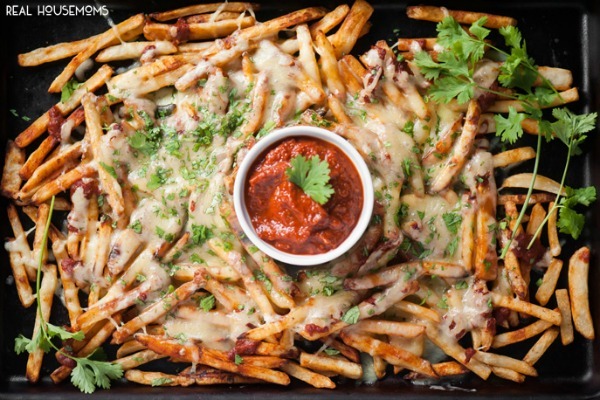 Since my loaded cheeseburger fries were such a hit, I am also making cheesy Chipotle Fries. You can loaded them up on a baking sheet and also serve them on it too. I think I gained 5 lbs just licking the screen looking at this! 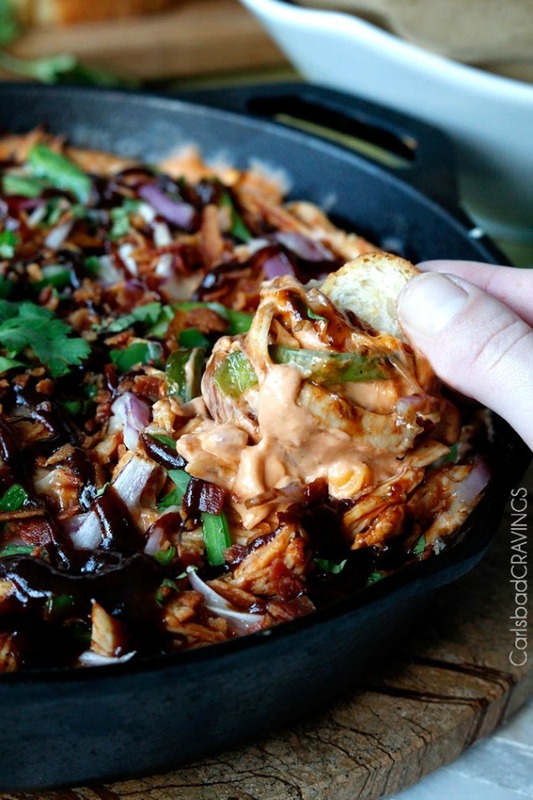 I need this BBQ Chicken Pizza Dip in my life! I may have gone overload board slightly on the easy football party appetizers menu! I’ve covered my bases, easy sliders, wings, cheesy dip and fries. YUM! Next Post » Donut Forget Valentine’s Day!